People like you need to be banned. Read the thread. I had stopped by the local Walmart yesterday for groceries, and I saw they had a few of both colors in the glass case. Very tempted to stop by today and pick one up. Checked the two stores in Marietta, GA this morning. All scanned in at $249.99. Is there anything I can do to help them make the price change? Something in particular to say? Went in to the Manville, NJ store in a rush on my way to work and rang up $249. Rather than missing my train for an override, I figured I'll just go in later for a price adjustment or return it and repurchase it later on my way home after they lower the price. They had like 10 of each BTW. Confirmed as of 8:00 a.m. in Wilmington, NC (Monkey Junction). They seemed to have plenty in stock and I was the only person in the electronics area. She told me I could return it within 15 days if my kid didn't like it....jerk. just got back from my local walmart in richmond indiana. they have dropped the price of the 3ds to 169.99. i picked up a 3ds with zelda and resident evil! they had 5 black and five teal! Stopped at the Cary and Apex, NC stores on my way in this morning. Still scanned at $249.99. Cary had a couple of each color. Apex didn't have any in their case, don't know about in the back. Success at W*M in Amherst, NH. The Dept. manager was in the process of revising the price when I arrived! They had both black and blue, plenty on hand of both. Got one in Starkville, MS. Wasn't reflected before 8:00, but did after. Price was updated, and I snagged mine at the reduced price. The cashier said she knew they would drop the price, given the way they were selling. There was an initial rush, but it was pretty slow going after that. Thanks, CheapyD, and to your unnamed yet reliable source! Now to actually buy a game... gonna swing by the local salvage store, they had a few games in there. At the very least, I may be able to take a few copies of Nintendogs and save some money towards OoT or something similar. Got one teal in Corpus Christi!! They have like 15 in stock. Went there 7:45 and they were in the process of changing the prices. They are still doing the Buy 1 get 40% off on 3ds games at ToysRUs if anyone is interested. I will be trying to do this I'm in Tulsa OK so i got another hour before i do so....my plan is to show my walmart receipt if they allow it ill buy from them get my reward points plus use my 50 dollars worth of reward points towards and then return the other back to wally world if not ill keep what i have and be happy i was able to get one before they sell out...... Thanks CheapyD! And Target has Ubisoft 3DS games for $17.00 as well...though I've heard the only one worthwhile is Ghost Recon. I may try to get my price adjustment today. I'll just have to make sure my Wal-Mart has actually lowered the price first before I have the Best Buy CS rep call over there. The Ames, IA Walmart (the super one, like we need two walmarts in this town) is good to go. The even had the rollback signs in the case saying the price was dropped. Had a few left of each color. I'm going to try to PM at BB soon, but I'm predicting pain. It worked for me in Omaha, NE. They had tons of them and the price label still said $250 but it was $170 when the guy rang it up, here's my receipt if you still need proof. It was no-go in NC. An Aqua Blue 3DS scanned at full price with the hand scanner. I did receive a free, condescending talking-down about pricing from the employee, and how it was highly improbable that the 3DS was getting a price rollback. I should have known they could never do anything right or on-time at my local Walmart. A winner is me at the Dunvale location in Houston. Had to have the Asst Manager override it but she knew exactly what I was talking about when the Electronics dept guy asked. Thanks Cheapy! Nope, farther West on Kirkwood. Let me know if you have any success at Dunvale. Went to the store in Schaumburg, IL this morning by my house no price drop. I figured cause I hate Walmart. Might try later on the way home. 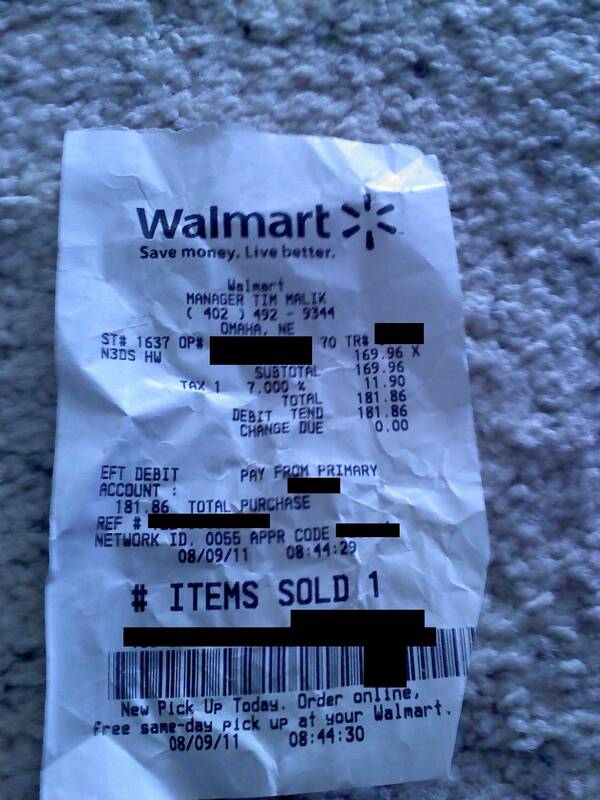 Going to stop by Walmart in an hour and get the 3DS I bought Friday price adjusted for the $80 refund. Starting to second guess my decision though. I'm excited that this deal is working but now that I actually sit and think about it, what am I gonna play on this thing? Z: OoT obviously is gold, but other than that...there is a pretty long wait before Starfox, Super Mario, Mario Kart, (insert more first party quality titles here) are released. Are there any quality older DS titles that anyone would recommend? Not trying to be a Debbie downer. I want a 3DS, I just need some convincing! And I know this deal is already crazy in my favor so if any one decides to burn me for this, well, eff you in advance lol. Get Ghost Recon at Target for $17. (Especially if you are an advance wars fan.) I played it late into the night yesterday, and am now trying to stay awake at work. It is a turn based strategy game of sorts. The 3D doesn't add too much to the game play mechanics, but adds a lot to the aesthetics. It almost feels like you are moving players in a diorama setup on your table. This is not just a game one buys early in a system's life because there are no others (though I will admit that is why I bought it ). It is a good game, period. walmart.com still listed at 249, so until I see it updated on the website I assume that the price drop is only at select locations. Walmart in DeKalb, IL was good to go. Went in at 7:45am CST. Asked for a price check and the electronics lady said she was just about to mark them down. Rang up no problem. $169.96. Thanks Cheapy!!! walmart.com did have a preorder for $169.96 in addition to the $249. The preorder said it ships on the 12th like amazon. This is why I'm waiting this time. Once I had played the only game I gave a crap about, there was nothing left to do with it. I'd much rather wait and get a good deal on it next time, like around Black Friday when hopefully there's something else to play besides Zelda. I basically felt like I paid $300 to play one game. Hi Guys (and Boston area CAG-ers)! Just got back from the store in Salem, MA. The manager didn't know what the deal was but ended up reducing the price after I asked her about it, so you should be able to get a 3DS at 169.99 at the Salem, MA store like I did This was after a failed attempt at the Lynn, MA store. The woman was not helpful and didn't even know when the department manager would be in. I would try Salem first if you have the change.